9-6-14 - I was in the country somewhere in a very large farmhouse. For some reason we had a whole lot of colorful ducks that were nearly as tall as myself, and they needed to exercise, so I asked permission to let them run around the kitchen table with myself. First we went one direction, and then we went the other direction. These ducks had colorful feahers on them and I knew they were Jewish ducks and they were not the eating kind - they were nearly as tall as myself. Ducks are seen many different ways by many different people and it is important to consider your own cultural lens and the way that you perceive ducks when you have a dream about them and you are trying to find out what it means to you. If you have a dream about duck, ducklings, duck eggs, etc then this means that you basically just need to think about how fortunate you are. 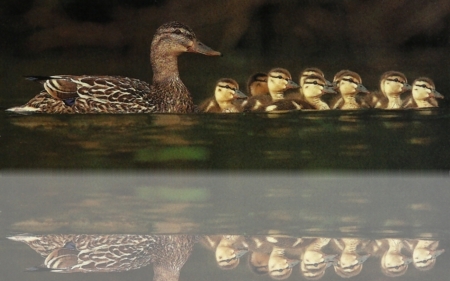 Ducks are known for being creatures that represent great fortune. They are great and lucky beasts. This is what they are known most for and why you care about them. Ducks are gorgeous, beautiful, and majestic. Having a dream of ducks means you have been lucky lately or that you will be lucky in the future. This will do you well to know. Just be real and be happy for your fortune. Ducks are also seen as hunted beings or living in fear. This usually has more to do with the American way of seeing them but duck hunting does not only occur in America and can be seen in cultures all around the world. The reason they are seen this way is difficult to place, but the fact is, the duck is seen as one of the most classically hunted creatures in the world because it just is. There are many people that go after lions, after bears, after elk, moose and all kinds of other came, but iconically speaking and speaking in terms of how they are perceived, ducks still lead the game in how they are seen as hunted beings. This means that if you have a dream in which you are a duck then you are worried that someone is out to get you. Most of the time this does not mean you are worried that someone is threatening your life. What this usually means is that you are worried that there is someone out there that is trying to make things worse for you or make your life more complicated. They can be out to get you in the sense that they are trying to make things more complicated for you or out to get you in the sense that they are trying to ruin your social life, your job or working environment, etc. You just feel like you are being hunted. To dream that you are hunting ducks means that you are the predator here. You feel like you are the one that is in control here and it is frightening others. While it might be a good thing to be in control sometimes especially if you are the one that is usually being picked on, it is best to handle this situation like you are playing with fire. You don’t want to hurt anyone else and it will make things terrible for you if you do not do all you can to make sure that you do not come off as the predator here then you will find it hard to keep your friends in a situation like this. It is important to keep note of where you stand on this issue and how you hope to repair any relationships that you might damage when you are wielding this absolute power. If there’s anything you should have learned in government class it is that power corrupts. 9-6-14 NAP DREAM - This dream was 'about' the other dream, and the voice said, "The duck trend"...do they mean 'duck and cover" trend? Dec 31, 2007 ... We just looked at each other, and I suggested we duck and cover," Paly sophomore LaPier said. "Well I was sitting at my dining table IMing ..
9-6-14 NAP DREAM. I was dreaming about the duck people again, and saw these numbers... 740, 60%, and the word snowman. Then I saw a web page with all these numbers larger and in boxes. After saying he would overhaul the nation's immigration system by the end of summer, President Obama has now decided to delay any action until after the November elections. The president told Meet the Press moderator Chuck Todd in an interview airing Sunday that the surge of unaccompanied children at the Mexican border changed the politics of the issue. "The truth of the matter is that the politics did shift midsummer because of that problem," Obama said in the interview. "I want to spend some time, even as we're getting all our ducks in a row for the executive action, I also want to make sure that the public understands why we're doing this, why it's the right thing for the American people, why it's the right thing for the American economy." The administration says Obama will take executive action to address the nation's undocumented population before the end of the year. But furious immigration activists are deriding the delay as a reversal of Obama's previous promises to curb deportations before the end of the summer. After efforts to pass a comprehensive immigration bill died in the Republican-led House of Representatives, Obama gave a fiery White House speech in June saying he would instead do it on his own. During that speech, he said, "If Congress won't do their job, at least we can do ours." But the president came under intense pressure from Democrats facing tough re-election battles who feared a stiff Republican backlash come November if the president made his announcement before then. Among their chief concerns was a plan to protect millions of undocumented immigrants from deportation, a move largely supported by immigration advocates but reviled as "amnesty" by many Republicans. "The reality the president has had to weigh is that we're in the midst of the political season, and because of the Republicans' extreme politicization of this issue, the President believes it would be harmful to the policy itself and to the long-term prospects for comprehensive immigration reform to announce administrative action before the elections," a White House official, who spoke on condition of anonymity because they were not authorized to publicly discuss the decision, said earlier Saturday in a statement. "Because he wants to do this in a way that's sustainable, the President will take action on immigration before the end of the year." 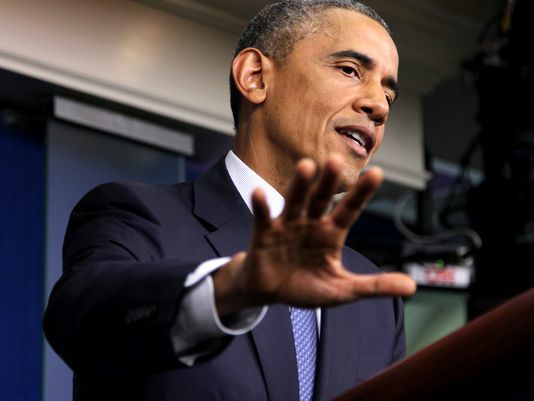 In his Meet the Press interview, Obama rejected criticism that the postponement is a political tactic. "What I'm saying is that I'm going to act because it's the right thing for the country," he said. "But it's going to be more sustainable and more effective if the public understands what the facts are on immigration, what we've done on unaccompanied children, and why it's necessary." Saturday's announcement was immediately blasted by immigration groups that have been pressing the White House to "go big." Officials at the Service Employees International Union, one of the strongest supporters of changing the immigration system, said they were "deeply disappointed but not paralyzed." Arturo Carmona, executive director of Presente.org, a group that supports legalizing undocumented immigrants, called the delay "shameful." "The president's latest broken promise is another slap in the face of the Latino and immigrant community," said Cristina Jimenez, managing director for United We Dream, a group of young undocumented immigrants pushing for an end to deportations. "Where we have demanded leadership and courage from both Democrats and the president, we've received nothing but broken promises and a lack of a political backbone. To wait nine more weeks means the president has agreed to deport more than 70,000 people, more than 1,100 every day, and continues cementing his legacy as the deporter-in-chief." The rush of Central American children across the nation's southwest border came at a difficult time for the White House. As Obama requested $3.7 billion from Congress to deal with the wave, a request that Congress has not yet acted on, the rush highlighted the nation's porous border and kept the gaps in the immigration system in the headlines throughout the summer. Adding to Obama's problems were complaints from vulnerable Democrats in the upcoming elections. Mark Krikorian, executive director of the Center for Immigration Studies, which opposes legalizing undocumented immigrants, said any executive action would have hurt Democratic Sens. Mary Landrieu of Louisiana, Mark Pryor of Arkansas, Kay Hagan of North Carolina and others. All of them had made statements in recent weeks urging caution and saying Congress should be the one changing the nation's immigration system. Doing something before the elections, Krikorian said, would have been "Christmas in September" for their Republican opponents. "I think that significantly limited his political maneuvering," he said. "Political commonsense prevailed at the White House." Obama's decision to delay the announcement could also depress the Hispanic vote, in turn hurting Democrats who need that voting bloc to win in November. Lynn Tramonte, deputy director of America's Voice, an immigrant rights group that had been urging Obama to act, said the delay will hurt candidates such as Sen. Mark Udall, D-Colo., who have large Hispanic constituencies who may stay home because of Obama's decision. "I hope that (reduced Latino turnout) doesn't happen," she said. "But if it does, it's on the Democrats." Obama made the decision Friday as he returned from a NATO summit in Wales, according to the Associated Press, which first reported the delay. White House officials said Obama made several calls to allies from Air Force One and continued making those calls Saturday morning. Senate Minority Leader Mitch McConnell, R-Ky., said Obama is playing "Washington politics at its worst." "What's so cynical about today's immigration announcement is that the president isn't saying he'll follow the law — he's just saying he'll go around the law once it's too late for Americans to hold his party accountable in the November elections," McConnell said. "President Obama should enforce the law, and if he would like changes, Republicans and Democrats alike have said he must work with Congress in a transparent, accountable way — not rewrite the laws on his own." Senate Majority Leader Harry Reid, D-Nev., said the fault lies with House Republicans who failed to take up immigration reform despite passage of the Senate bill. "I know that the president is determined to act, and when he does I support a broad use of his authority to fix as much of our broken immigration system as he can through executive action," Reid said. "After the president takes these initial steps, it will be up to Congress to finish the job and enact a permanent solution that fixes our immigration system once and for all." would hurt their prospects in tough Senate races. crisis and thus a volatile climate for taking the measures he had promised to take. "The truth of the matter is - is that the politics did shift midsummer because of that problem,"
right thing for the American people, why it's the right thing for the American economy." the face of the Latino and immigrant community." we've received nothing but broken promises and a lack of political backbone," she said. have chosen politics over people, the status quo over solving real problems." control hangs in the balance. Among those considered most at risk were Democratic Sens. Mark Pryor of Arkansas, Mary Landrieu of Louisiana and Kay Hagan of North Carolina. the officials said the discussions around timing grew more pronounced within the past few weeks. for gun-control legislation, undermining any interest in passing future gun measures. decision-making designed around the best policy." the idea of executive action on immigration "smacks of raw politics." the people they are supposed to serve," Boehner said. had not envisioned such a battle when Obama made his pledge in June. during August has taken attention away from the border for now. to become legal residents, pay taxes, pay a fine and learn English. She is President Obama’s conscience on immigration — and his chief defender against those who say he’s done too little to protect immigrant families. Which means it has been a busy summer for Cecilia Muñoz, the president’s domestic policy director and the highest-ranking Hispanic official in the White House. Last week, she was among the West Wing staffers delivering the news to Democrats on Capitol Hill and to activists that Obama would postpone plans to use executive action to defer deportations for many of the nation’s 11 million undocumented immigrants. For Muñoz, 52, it’s a role she has played since joining Obama’s staff in 2009 after a two-decade career as an outspoken immigrant rights leader. Time and again, Obama has relied on her to justify the immigration policies she fought so fiercely when she was on the other side of the table. Muñoz has been called upon to defend an administration that has deported more than 2 million people, most of them Hispanic. And time and again, she has had to defend a president whose inability to stem many of the removals has disappointed Latino voters, who supported him in record numbers. 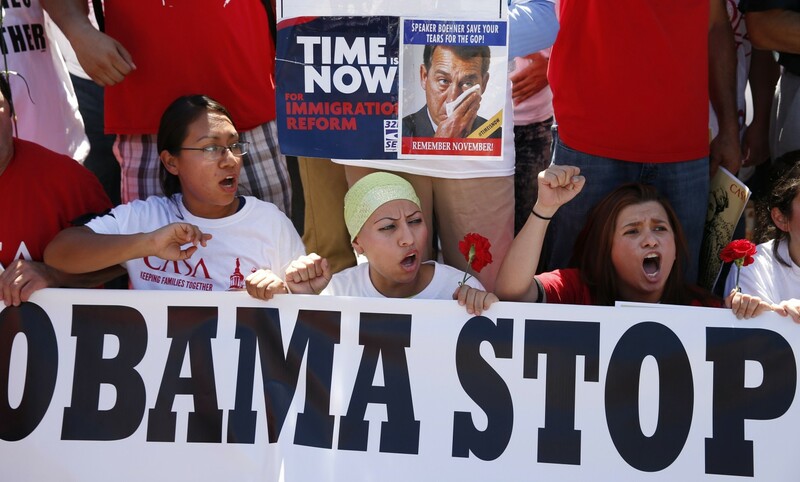 The collapse of comprehensive immigration legislation in Congress this summer has raised the stakes for Obama. He pledged in June to use executive authority to remake border-control policies by summer’s end. But the White House announced Saturday that he would not act until after the midterm elections in November because of political concerns from jittery Democrats. The news only added to the list of disappointments for Latinos, activists and some Democratic lawmakers. Advocates who are pushing Obama to grant deportation relief to millions of undocumented immigrants say this represents the last chance for the president — and, by extension, Muñoz — to salvage their legacy in the Hispanic community. Muñoz declined to comment for this story, but in an interview with MSNBCon Monday, she blamed Republicans for not supporting an immigration bill. The daughter of Bolivian immigrants, Muñoz grew up in a Detroit suburb, and she recalled a friend telling her that her parents would belong in an internment camp if the United States were to become involved in Latin America’s civil wars in the early 1980s. “My outrage that day became the propellant of my life, driving me straight to the civil rights movement,” she wrote in an essay for NPR. It also drove her straight into the center of Washington’s immigration debate. Advocates credit Muñoz with standing up to the Clinton White House to restore food stamp assistance to legal permanent residents in 1997. The late senator Edward M. Kennedy (D-Mass.) consulted her regularly as he and Sen. John McCain (R-Ariz.) developed comprehensive immigration legislation in 2007, a bill that failed to pass the Senate. In 2000, Muñoz’s work on immigration policy earned her a prestigiousMacArthur Foundation “genius” grant of $500,000. Muñoz also caught the eye of Obama, who, shortly after joining the Senate in 2005, held a meeting with her and other civil rights leaders. As Congress debated immigration legislation in 2006 and 2007, Obama brought Muñoz to his office for regular policy briefings and occasionally called her on her cellphone. Muñoz turned down the initial offer to join his White House staff as director of intergovernmental affairs because of personal concerns. Her mother had recently died, and Muñoz and her husband, Amit Pandya, a human rights lawyer, were raising two teenage daughters. If Muñoz was eager to get started on sweeping reform, others in the Obama White House were not. Obama’s first chief of staff, Rahm Emanuel, had referred to immigration as the “third rail of American politics” while serving as head of the Democratic Congressional Campaign Committee. In the first two years of Obama’s presidency, when Democrats had control of both houses of Congress, the White House put most of its political muscle into securing an economic stimulus and a health-care overhaul. White House officials emphasize that the president helped push the Dream Act, which offered legal status for young immigrants brought to the country as children, through the House in 2010 before it failed in the Senate. In the meantime, however, the administration ramped up deportations of undocumented immigrants, betting that a strong enforcement record would mitigate Republican arguments, in the debate over comprehensive reform, that the border was not secure. In October 2011, the White House dispatched Muñoz to defend the deportation policies on a PBS documentary, “Lost in Detention.” Responding to a question, Muñoz said that “even broken laws have to be enforced,” and she added that the administration had to fulfill the congressional budget mandate that allocated resources to deport 400,000 people a year. Within days, Presente.org, a Latino rights group, launched a petition saying she had misrepresented the facts. Muñoz “used to be a champion for immigrant rights. Now she is the main defender of failed programs,” the petition said. 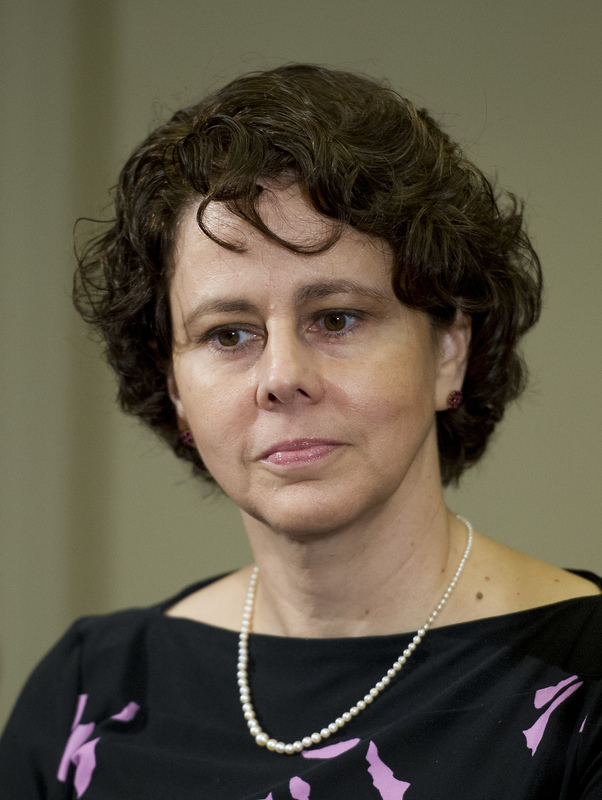 Friends vehemently dispute criticism that Muñoz has betrayed her values. The administration has revamped its policies to focus deportations on immigrants who have committed felonies or multiple crimes and those who have recently arrived. And colleagues point to her influence on Obama’s announcement, in June 2012, that his administration would no longer deport most younger immigrants who had come to the country illegally as children. The decision, which came during the president’s reelection campaign, was considered politically risky by some — but Obama won more than 70 percent of the Latino and Asian American vote that November. His “deferred action” program has since benefitted more than 580,000 people, and Obama is reportedly considering a major expansion that could benefit millions more immigrants as part of his executive actions. Immigration law refers to national government policies control the phenomenon ofimmigration and deportation to their the legal status of people, in matters such ascitizenship. Immigration laws vary from country to country, as well as according to thepolitical climate of the times, as sentiments may sway from the widely inclusive to the deeply exclusive of new immigrants. Certain countries may maintain rather strict laws which regulate both the right of entry and internal rights, such as the duration of stay and the right to participate ingovernment. Most countries have laws which designate a process for naturalization, by which immigrants may become citizens. The immigration laws in the United States have experienced uneven progress. During colonial times independent colonies created their immigration laws. The first law governing the naturalization of foreigners was the Naturalization Act of 1790. However many years later the Chinese Exclusion Act was passed to stop the immigration of Chinese people. The Emergency Quota Act of 1921 and the Immigration Act of 1924 put a quota on how many immigrants were permitted, based on nationality and previous influx years. TheImmigration and Nationality Act of 1952 led to the creation of the Immigration and Naturalization Service. Homeland Security, the Department of Justice, the Department of State, the Department of Labor, and the Department of Health and Human Services. 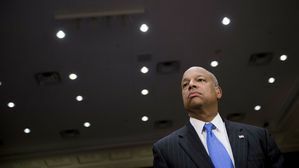 Of the five, the Department of Homeland Security, which replaced the Immigration and Naturalization Service, enforces immigration laws and bestows benefits on illegal immigrants. Immigration and Customs Enforcement, and Customs and Border Protection. The United States allows more than 1 million illegal immigrants to become Legal Permanent Residents every year, which is more than any other country in the world. The United States also issues more Visas than any country in the world. Visas in the United States can be broadly separated into two categories: one for people seeking to live in the US; termed Immigrant Visas, and the other for people coming for limited durations, termed Non-Immigrant Visas. 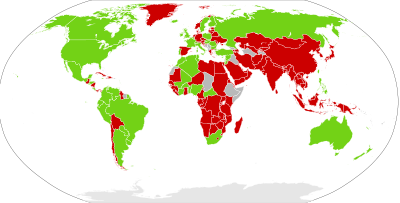 The former visa has "per country-caps", and the latter does not. Most non-immigrant visas are for work purposes, and usually require an offer of employment from a US business. Such immigration may involve restriction such as a labor certification to ensure that no American workers are able to fill the role of the job, hence designed to protect wages and conditions. Other categories include student, family and tourist visas. Each visa category is further divided into numerous subcategories; the large number of specific categories has been recommended as a main area for comprehensive immigration reform. To control immigration, many countries set up customs at entry points. Some common location for entry points are airports and roads near the border. At the customs department, travel documents are inspected. Some required documents are a passport, aninternational certificate of vaccination and an onward ticket. Sometimes travelers are also required to declare or register the amount of money they are carrying. Asylum seeker temporary residence pending decision whether applicant qualifies for refugee status. After 5 years recognised refugee status may request permission to apply for permanent residence. General Employment Policy (GEP); will receive Right of Abode (ROA) in Hong Kong, after 7 years continuous ordinary residence in Hong Kong. General Points Test (GPT) Capital Investment Entrant Scheme (CIES); you need to invest HK$10 million except on real estate;will receive Right of Abode (ROA) in Hong Kong, after 7 years continuous ordinary residence in Hong Kong. passing General Points Test (GPT) within Quality Migrant Admission Scheme (QMAS) Person under 21 years of age born in Hong Kong of foreigner with HK Permanent ID Card, will receive Right of Abode (ROA) in Hong Kong, but not Chinese nationality. Foreigner who is a Hong Kong Permanent ID Card holder may naturalise as Chinese national with HKSAR Passport, if applicant has settle in Hong Kong or Chinese territory, has near relatives of Chinese nationals, and other legitimate reasons. Mainland Chinaissued a daily quota of 150 One Way Permits to mainland Chinese for Hong Kong settlement; will receive Right of Abode (ROA) in Hong Kong, after 7 years continuous ordinary residence in Hong Kong; plus the right to apply for aHKSAR Passport. Not available There are programs forContinental Refugees andRepatriates but the rules are severely tightened to prevent as little new migrants as possible to benefit from them. Will resident visa holder dependant be allowed to work as well? Is it possible to bring old parents once got settlement? Would the country require to surrender a previous citizenship(s) to apply for a citizenship of this country? Would the country require to surrender its citizenship if its citizen applied for a citizenship of other country? Immigration regulation is the control of the people, and their numbers, who may enter a nation's sovereign territory. It applies both to persons seeking to live and work in a particular nation (or part of it) and tourists, persons on layover due to travel issues, and those wishing to study or otherwise make use of a country's facilities. Immigration control of one form or another is imposed by most countries. It is an inherent right of a sovereign state. Jump up^ Proper, Emberson. Colonial Immigration Laws. Buffalo: William S Hein & Co., Inc., 2003. Print. Jump up^ "USCIS Home Page". Uscis.gov. Retrieved 2012-04-01. Jump up^ "cbp.gov". cbp.gov. Retrieved 2012-04-01. Jump up^ Schaefer, Kimberley. "DC Immigration Visa Bulletin".http://dcimmigrationattorneyblog.com/. Retrieved 6 August 2012. Jump up^ Labor Certification: What Are “Unduly Restrictive” Job Requirements? Jakeman Shaklee Oliver National Immigration Lawyers. Accessed June 10th, 2013. Jump up^ American Visa Bureau (2011-12-22). "US visas". Retrieved 2011-12-22. Jump up^ Architecture for Immigration Reform - University of Denver. University of Denver. Accessed June 10th, 2013. Jump up^ "Working temporarily in Canada". Cic.gc.ca. 2012-01-26. Retrieved 2012-04-01. Jump up^ "Immigrating to Canada". Cic.gc.ca. Retrieved 2012-04-01. Jump up^ "immi.gov.au". immi.gov.au. Retrieved 2012-04-01. Jump up^ ; will receive Right of Abode (ROA) in Hong Kong, after 7 years continuous ordinary residence in Hong Kong. Jump up^ "Репатриация в Польшу. Новый закон о репатриации, права репатрианта в Польше - официальная информация" (in Russian). Wiza.polska.ru. Retrieved 2012-04-01. Jump up^ "Working in Sweden - Migrationsverket". Migrationsverket.se. 2011-12-22. Retrieved 2012-04-01. Jump up^ "Self-employed from countries outside the EU - Migrationsverket". Migrationsverket.se. 2012-02-21. Retrieved 2012-04-01. Jump up^ "Asylum seekers - Migrationsverket". Migrationsverket.se. 2011-05-19. Retrieved 2012-04-01. Jump up^ "Решение об отмене израильского гражданства и как с этим бороться". Pravo.israelinfo.ru. 2012-02-19. Retrieved 2012-04-01. U.S. Immigration Law, Business Law, Commercial Litigation, Employment Law, Admiralty & Maritime Law and Personal Injury.